PhD 2001, Max Planck Institute for Dynamics and Self-Organisation, Göttingen. Postdoctoral research at the Kavli Institute for Theoretical Physics, Santa Barbara, California. 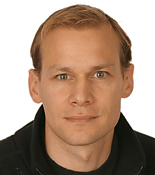 Group leader at EMBL Heidelberg since 2007.